As the subspecies are the same, I will combine the sightings report here. 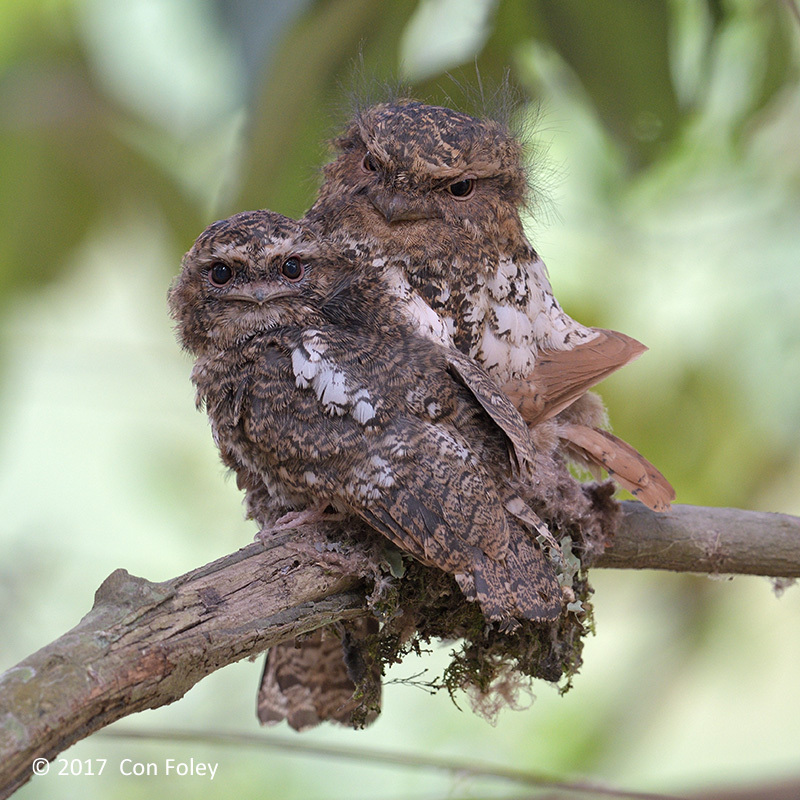 Hodgson’s Frogmouth Batrachostomus hodgsoni is an uncommon montane resident usually 900-1900m ASL, with a scattered distribution from the foothills of NE India to Vietnam. 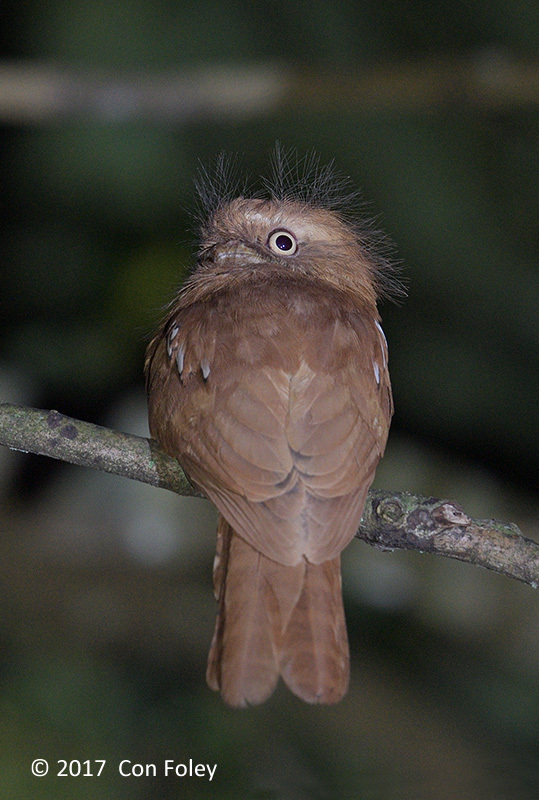 The indochinae subspecies occupies the Eastern end of the range, and is the one being documented here. 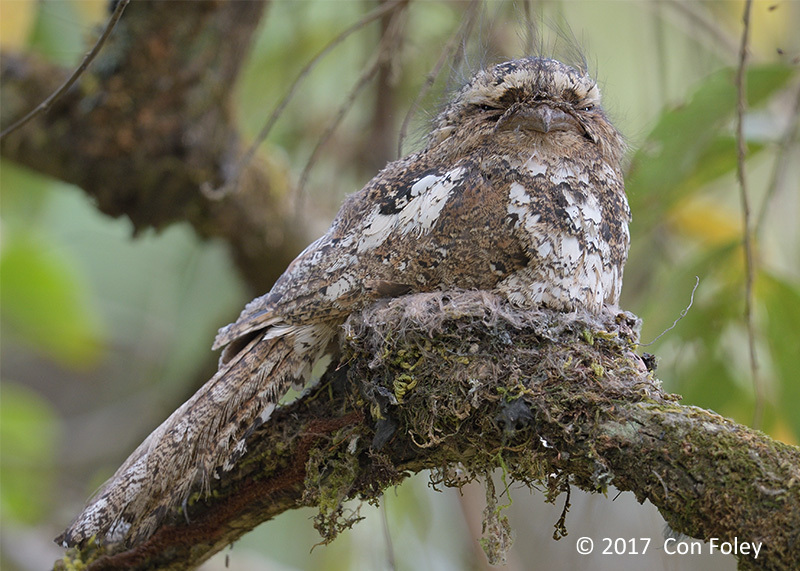 Overall the appearance of this species is very close to Blyth’s Frogmouth (or Horsfield’s Frogmouth) Batrachostomus javensis affinis, but Blyth’s is a lowland frogmouth rarely about 800m, so these two species replace each other in altitude but occupy much of the same range. 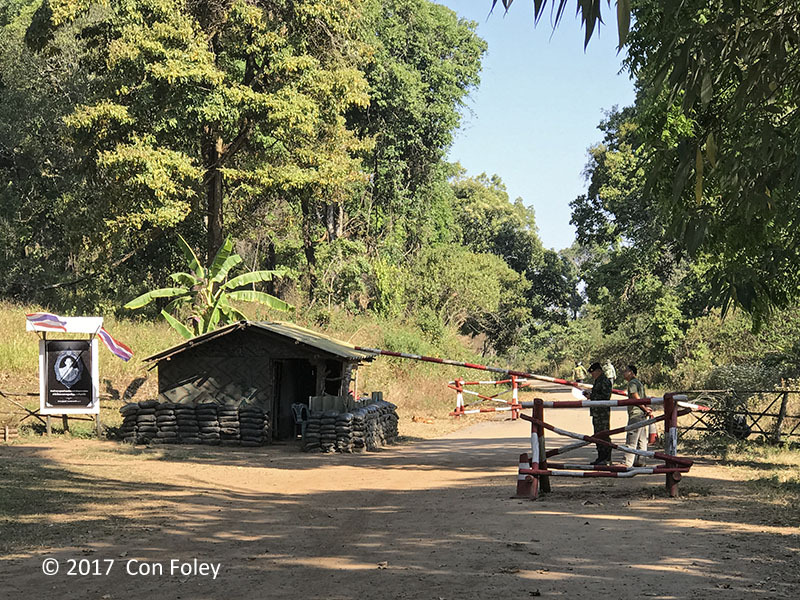 The first nesting seen was at Doi San Ju in Northern Thailand on 18 Mar 2017, just a few meters beyond the border police checkpoint. The police were well aware of the nest and happy to show it to you, but you could not stay until nightfall, the park was closed. So the nest was well guarded! This year there was just one chick in the nest, and it successfully fledged on April 2. 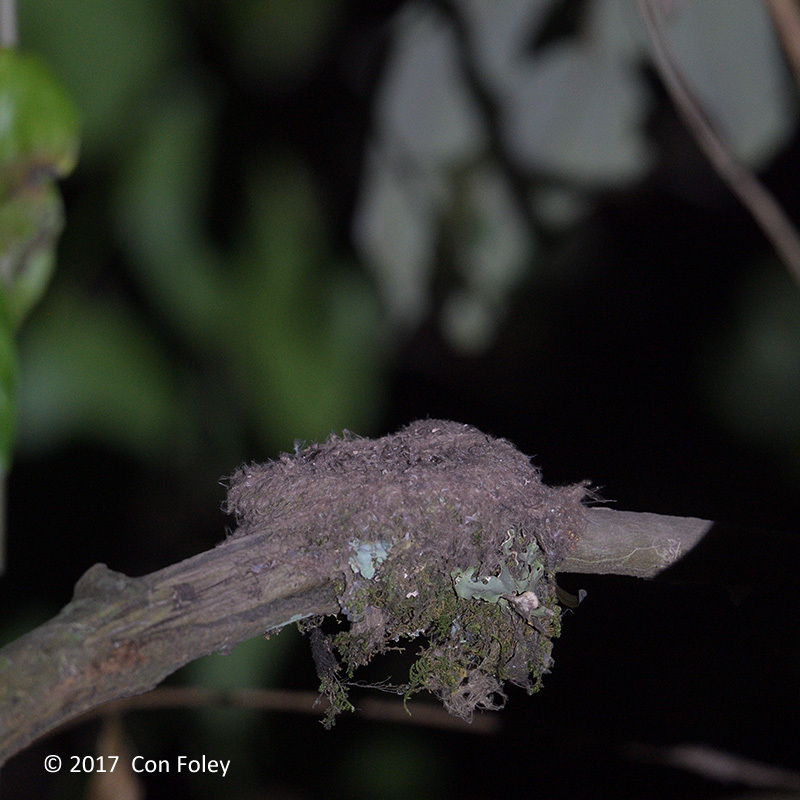 The nest was located about 3m off the ground on a rather smallish tree, but one with some tangled vegetation offering some concealment at about 1640m ASL. At this early nesting stage, the chick is not visible in my photo. 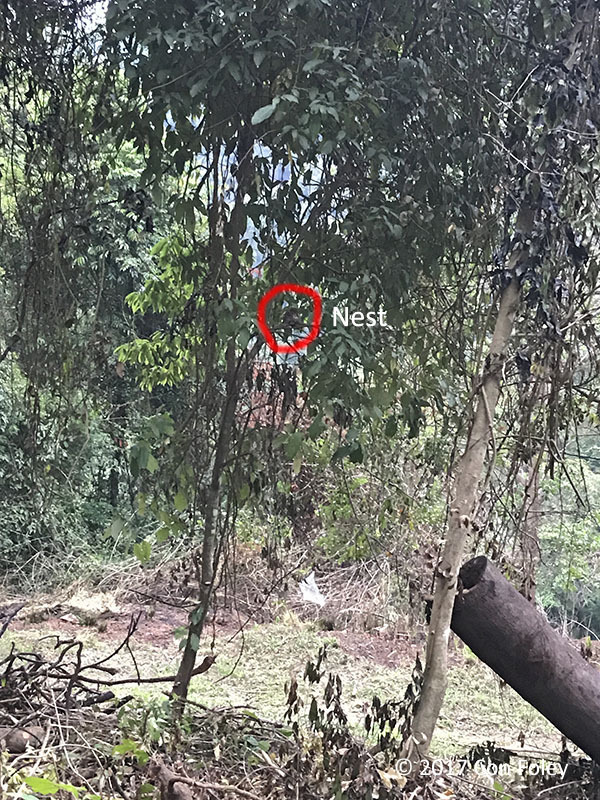 The second nesting was seen on 19 April 2017 on private property in the Da Lat plateau of Southern Vietnam, at about 1385m ASL. The property owner had been clearing land, and noticed the nesting and left that tree intact. Again a rather smallish tree, the nest was also located about 3m off the ground. In neither case was the nest very obvious, if you were just walking past you certainly would not notice. 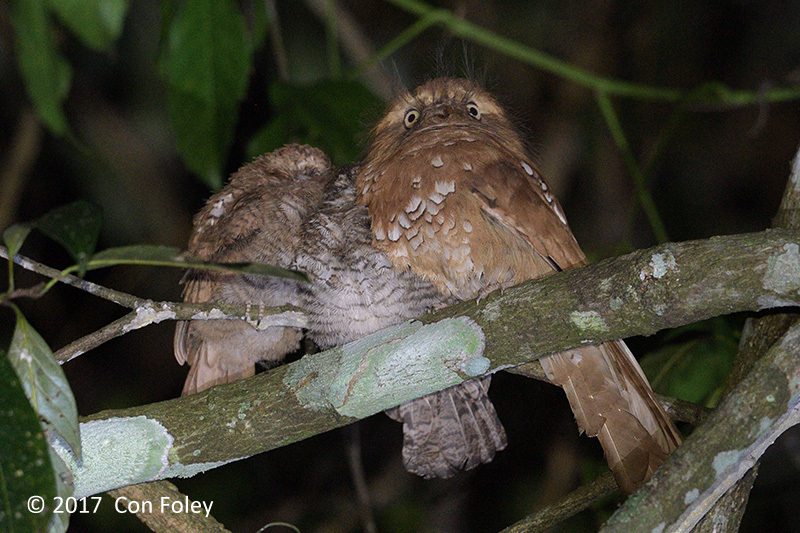 For many species of Asia frogmouths the male is greyish and the female rufous in overall appearance. I was interested to see that even at this stage of development the chicks colors were very different, making it easy to tell which was male and female. 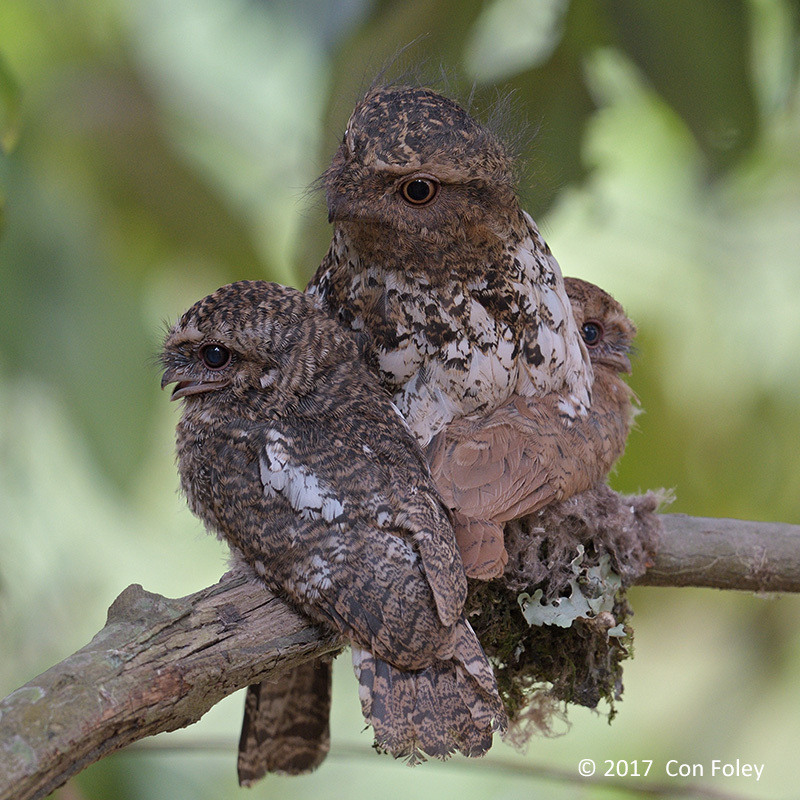 For many bird species, sexual dimorphism does develop until much later. With permission from the property owner we had decided to stay until after dark to watch the male and female change duties. I was especially keen to do that since it wasn’t possible in Thailand. 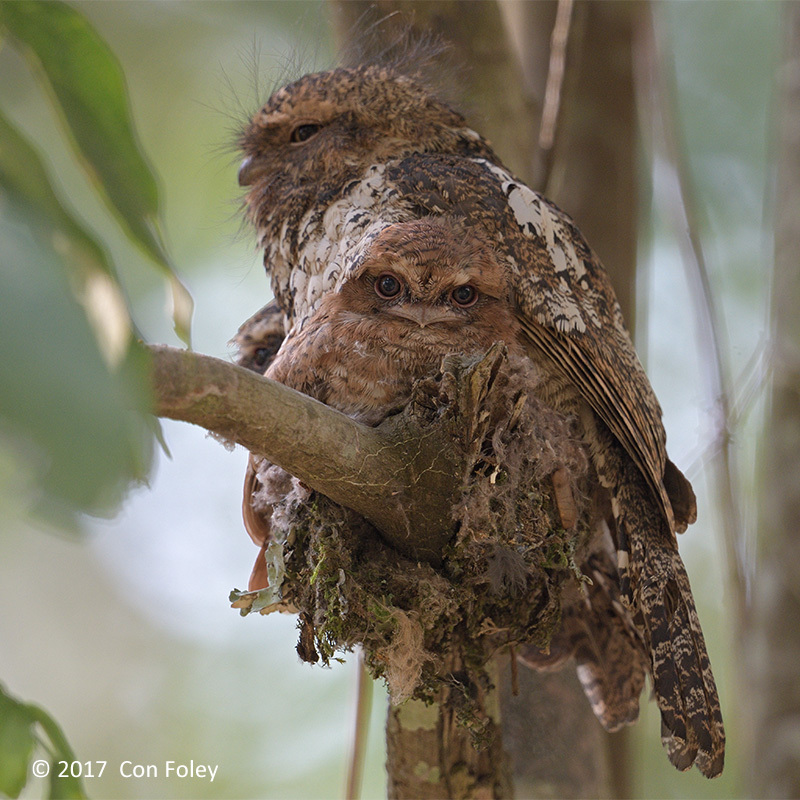 For the Asian frogmouths, the male always stays with the nest during the day, and at dusk the female replaces him, and then he goes out to hunt and bring food to the nestlings. 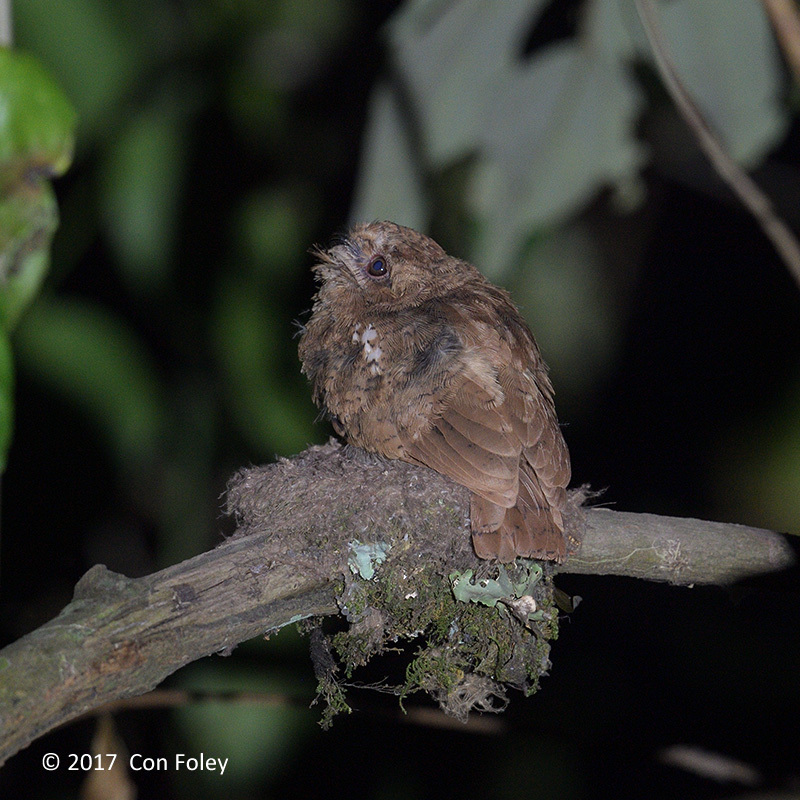 Little did we know that the chicks would fledge that very night! 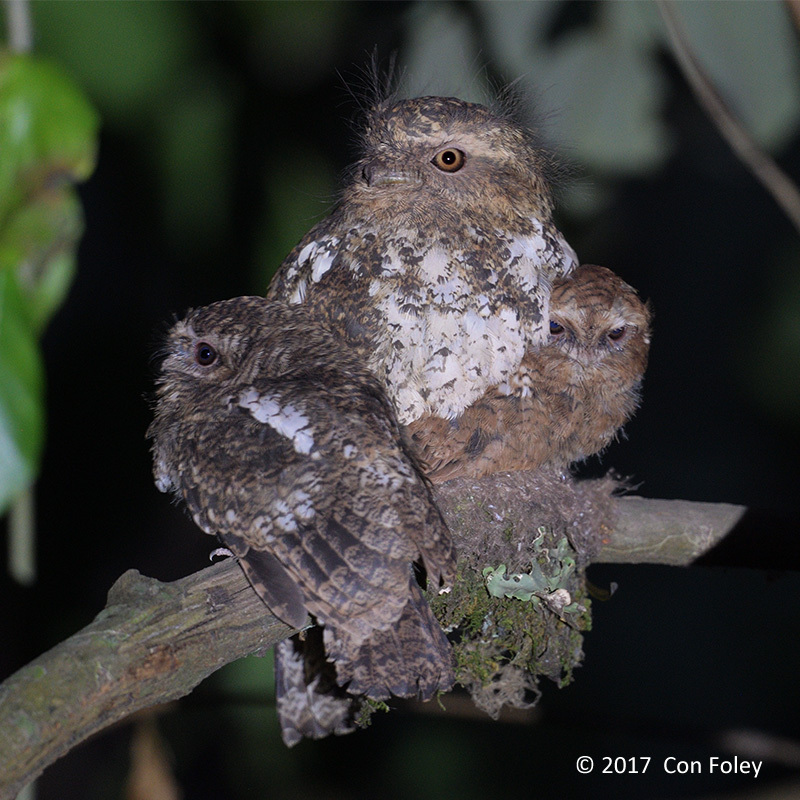 As darkness approached the frogmouths became more alert. Sunset on that date was 6pm, here is the male and two chicks at 6:11pm. And then we saw a dark shadow fly, and at 6:18pm only the juvenile female was still there. And then a few minutes later at 6:25pm she was gone too, and it was an empty nest. Later we located the two fledglings about 5m up in a nearby larger tree, and the adult female was with them. 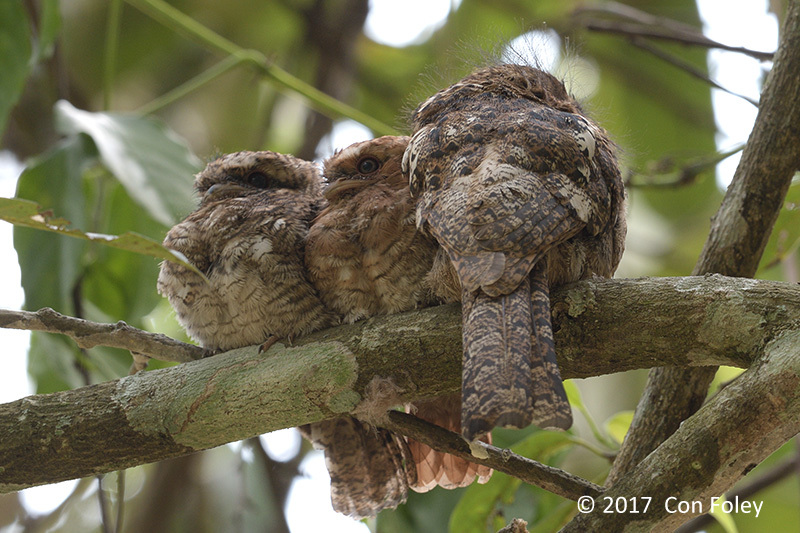 This is the behavior of this genus, the female spends the night with the chicks and the male the day. Later she moved away from the chicks, and was on her own for awhile. Look at that wild hairdo ! The next day we paid another visit, and the chicks and the adult male were in exactly the same tree as the night before. Stephen ( from stephen’s place in Fraser’s hill )gave me your name . We are a couple of french birders and we would like to visit panti forest in the end of july beginning of august 2018.He told me that you very well know this area .Is it possible for you to guide us ? If not , could you help us by giving the name of one of your collegues . On the other hand I saw on internet that a permit is required .How could we get it ?